The benefits of HealthWave Human Growth Hormone Homeopathic Spray are huge and without any side effects. In both clinical and anecdotal studies, patients using this spray achieved an increased energy level and an improved feeling of well – being. They felt and looked greatly rejuvenated and younger. Skin, hair and overall appearance showed improvement. Muscle tone increased and total body function also improved. Optimum weight loss was quickly achieved. Minor aches and pains disappeared while major injuries seemed to heal much quicker. In summary people using the HealthWave hGH spray felt better, looked better and younger and had much more energy. Fred Pescatore, MD, MPH, CCN, a renowned author and medical director of the Centers for Integrative and Complementary Medicine of New York City performed a medical clinical study on his patients with this HGH Homeopathic. His results from the study were that it significantly raised the Human Growth Hormone levels of his patients. It releases your own hGH. It shows as an increase in insulin Growth Factor (IGF) which is a result of releasing person’s own human growth hormone. One bottle is a whole month’s supply! The dose is an easy 5 sprays once a day! HealthWave hGH Homeopathic Spray has the energy signatures or energetic imprints of Human Growth Hormone, Insulin, Growth Factor One and Pituitary Extract. It does so by containing homeopathic or infinitesimal amounts of these substances. Much in the same way that vaccines activate the immune system of the body, this spray affects the communication of the Pituitary and Hypothalamus Glands of the body to stimulate these glands to produce the person’s own Human Growth Hormone. 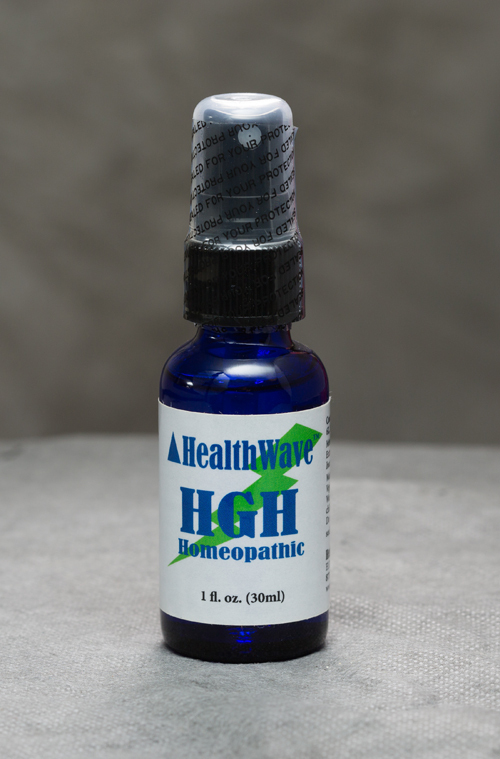 HealthWave hGH Homeopathic Spray has been developed to effectively stimulate the Pituitary and Hypothalamus without causing a rebound effect as seen in other HGH products and is designed to keep the pituitary, adrenals and other glands of the body in balance. HealthWave hGH Homeopathic Spray has been significantly enhanced by a proprietary Energizing Scalar Wave process that increases its effectiveness and stability. This increases the communication of the product with the cellular intelligence matrix of the whole body. HealthWave Human Growth Hormone Spray has been proven to be Anti-Aging, increases energy and well – being, is very economical along with its great value! And comes with a Better Health or money back guarantee! Was invented for and was treated by a medical doctor. An easy to use bottle of energy is a whole month’s supply! Just 5 sprays used once a day. The best approach to anti- aging is an hGH Homeopathic containing very small, diluted amounts of Human Growth Hormone or its energy signature. This stimulates the Pituitary Gland of the body to create the body’s own Human Growth Hormone instead of supplementing with HGH directly. The problem with most homeopathics is that they have too weak of an energy signature of Human Growth Hormone or the homeopathic energy has dissipated, leaving the product unstable and ineffective. Many homeopathics are effective for only six months or less, while the HealthWave HGH has a very strong and stable energy signature and has a two - year shelf life. HealthWave hGH Homeopathic Spray has the energy signatures or energetic resonant imprints of Human Growth Hormone, Insulin Growth Factor One and Pituitary Extract by containing homeopathic or infinitesimal amounts of these substances. Much in the same way that vaccines activate the immune system of the body; the energy signatures in this spray effect the communication of the Pituitary and Hypothalamus Glands of the body. This stimulates these glands to produce the body’s own Human Growth Hormone. The best guide to the optimum dose is to observe one’s energy level. If your energy level goes down, the dose is too high and it’s best to cut the dose in half or to skip a day. This is just the opposite of most pharmaceuticals. Some younger people will get the greatest benefit from this product by taking it every other day or as little as once a week, while other people who are older with medical problems may get the greatest benefit by dividing their dose and taking it twice a day. A younger person with Chronic Fatigue Syndrome, an injury, who works out a lot or an athlete may benefit from a larger dose than normal. HealthWave hGH has been developed to eliminate the rebound effect and other problems associated with other Human Growth Hormone products. It is unique because it is very strong yet very safe. It effectively stimulates the pituitary without causing the rebound effect and is designed to keep the pituitary, adrenals and other glands of the body in balance. It has been giving significant results for thousands for the past 12 years! HealthWave HGH has been significantly enhanced by a proprietary Energizing Scalar Wave process that increases its effectiveness and stability. This increases the communication of the product with the cellular intelligence matrix of the whole body. Because of its energizing effect, it is best to take this spray first thing in the morning. The product is sprayed in the mouth or under the tongue, held for about 5 seconds and then swallowed. It tastes very good. The dose is 5 sprays a day, giving this very beneficial product a one-month supply per bottle. An observation has been made that human growth hormone products are expensive. Compared to other Human Growth Hormone products, HealthWave hGH Homeopathic Spray is very inexpensive and is an exceptional value at a very low price. HealthWave hGH Spray has been proven to be Anti-Aging, increases energy and well - being, is very economical along with its great value! And comes with a “Better Health” or money back guarantee! The above statements have not been evaluated by the Food and Drug Administration. The information is not intended to diagnose, treat, cure or prevent any disease and is given as educational information only. We use our best efforts to maintain the personal information you give to us in a secure, safe and responsible manner. The personal information you provide us is not sold, rented or leased to any third party. When you purchase our products from us, whether in person, over the phone and/or on-line you provide us with information. Depending upon what information you provide to us and whether, and where, you purchase products and/or services, the information we receive may include your name, mailing, billing and/or shipping address, telephone number, driver’s license number, birth date, form of payment, e-mail address, property information, service preferences, what you purchased. If you use a credit or debit card or pay by check, the information we receive will include your account number and your form of payment. HealthWave, Inc. uses the information you provide to service your account, to ship an order to you, to provide warranty service on products you purchased, and to personalize your experience with Healthwave, Inc. For these purposes, your information may be shared with a third party service provider. RETURNS: We offer a 60 day return for any reason, used or unused. SHIPPING: $6.99 per shipment priority mail. Free shipping for orders of 12 or more. The statements on this website have not been evaluated by the Food and Drug Administration.The information is not intended to diagnose, treat, cure or prevent any disease and is given as educational information only. The Healthwave, Inc. has company policies and procedures in place to ensure that information you share with us is handled in a safe, secure and responsible manner. We use encryption and other types of technology to reasonably protect and safeguard your personal information and services we provide you. Copyright 2018 - Healthwave Inc., All Rights Reserved.